Box braids are one of the most popular hairstyles among African Americans, and it’s no wonder why. They’re stylish, easy to maintain, and can be worn in various styles. 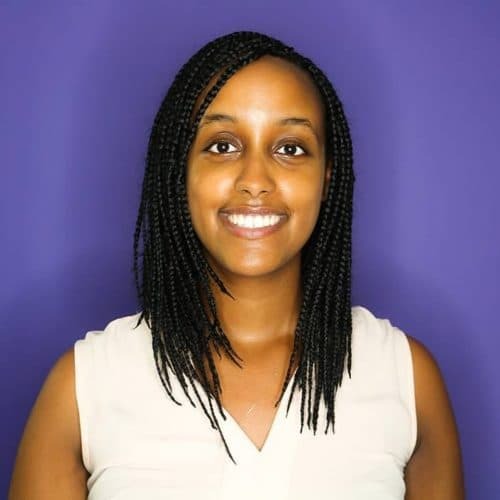 Check out what the pros say about box braids hairstyles. This look gives a twist to the conventional square parted box braids. The triangle parts and the touch of color adds a maze-like funky flare to the hairstyle that screams confidence, edginess, and style. The length adds dimension to the look and also makes the style versatile in a way that can be worn in a bun, top knot, ponytail, or just simply down. My favorite thing about this hairstyle would have to be the color. It’s subtle but still noticeable. 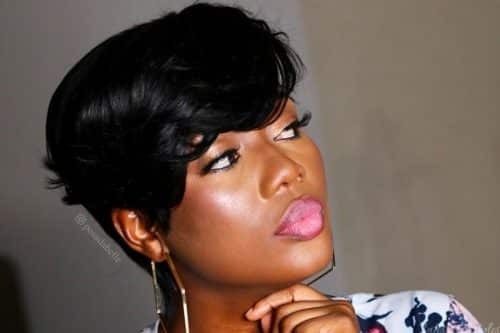 If a client wants to explore getting this hairstyle, I’d say go for it! It’s a cute carefree look especially since we are approaching the warmer months and vacation season is approaching us. Clients have to understand the culture of their workplace to determine if this exact style is suitable for their work environment. Your hairstyle choices are a direct extrinsic reflection of your personality why not show it off! This hairstyle gives you a very classy look. It looks very simple and very easy to manage. You can wash your hair while having this style, grease it, and my favorite thing about this style is that it lasts a very long time for about 3 months. Since this style is 3 layers when it gets old and starts to get messy, you can always do the top part over and make it look brand new and because it lasts so long. It gives your hair time to breath which makes it grow. This hairstyle is for people who like that “one-look” look. What I mean by that is that you can’t really style it in any other ways. The only thing you can do is it in a low bun or ponytail or just leave it down. It’s not like other hairstyles where you can style it and do all these things with, so this is for a person who is ok with having the same look for about 2 months. This look is for someone who doesn’t have the patience to sit in a salon for more than 2 hours because that’s the actual time it took me to complete this look. 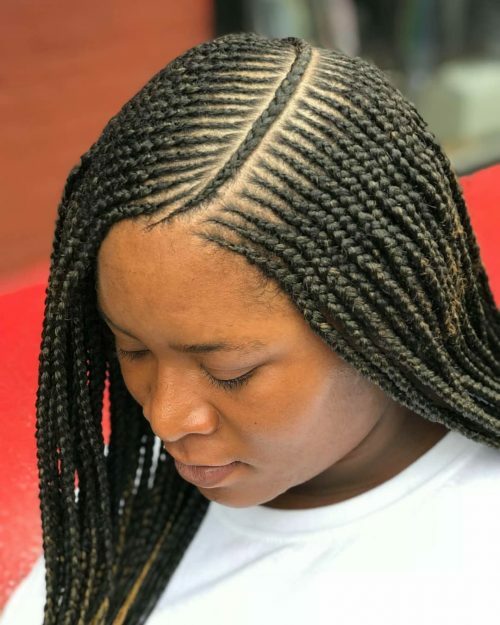 Firstly this style isn’t for someone who is getting braids for the first time because it can be a bit difficult to handle for styling and when it’s time for bed. This style definitely works with any hair type. 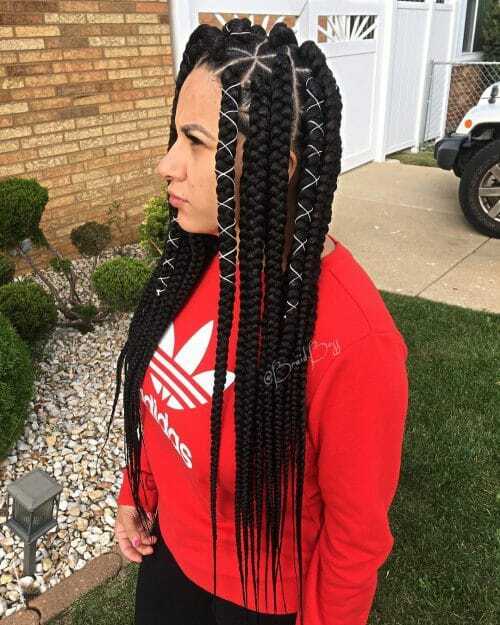 This style is suitable for someone with a bubbly personality and one who has a passion for long braids and doesn’t have the time to be doing hair every morning. This style is trendy, and my favorite thing would be is that it’s really cute, light, and versatile. It’s a versatile, protective style with easy maintenance. This style is edgy and low maintenance. One thing I like about this look is that it is versatile. The middle could be put up into a bun or even split into two parts with a bun on the top and the bottom free, giving it a new look. This style is perfect for a person with a lot of personalities, especially when worn with colored extension hair. The individual can be creative with colors to give it a nice flare. To keep up with this style, it is best to wear a silk or satin scarf over the hair at night to make sure the style maintains neatness over a period of time. This style can last up to 4 weeks. I usually inform my clients not to wear these sorts of styles longer than 4 weeks. I’m all about keeping the natural hair healthy. Also, all hair types can enjoy this look. However, the size of the braids may vary depending on the texture at hand. You must consider the weight of the extension hair when adding. Last but not least, an edge control product can be used on the front perimeter of the hairline to keep the finer hairs intact. 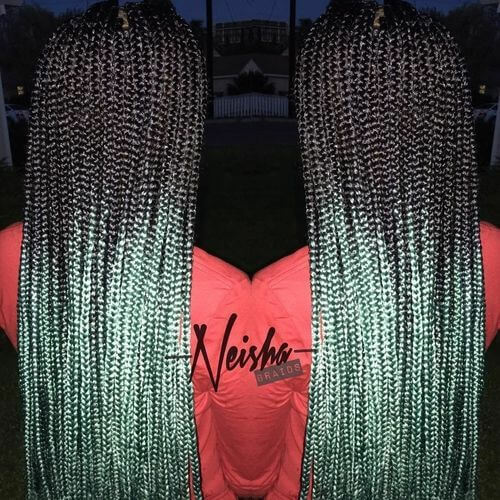 These are box braids that are long, lightweight, and offer many variations of styling. They have the ability to last up to four to six weeks. 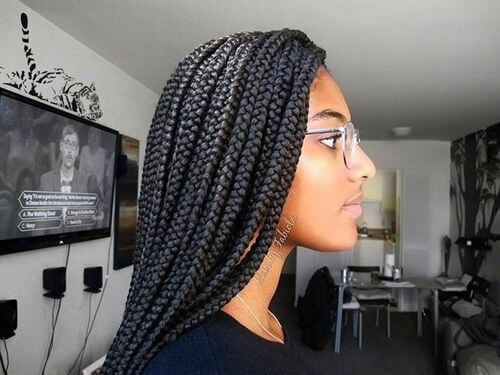 What products do you recommend to maintain and recreate these box braids? Start with freshly washed and detangled hair (at least three inches of hair is required). I used six packs of Xpressions braiding hair, a parting comb, Shine n’ Jam Extra Hold), hair clamps or hair ties, scissors and an electric water boiler. You will dip ends into the boiler once finished to seal the ends. To maintain these box braids, you can use an oil of your choice such as jojoba, olive oil, Argon, black castor oil, or even coconut oil. An oil should be applied two to three times per week. You can also use dry shampoo to clean the scalp. Hair should be tied down at night with a scarf. I have clients with all hair types from extremely fine to extremely coarse. Absolutely any hair type can try out these long box braids. These braids would best fit the person who wants a break from styling their hair daily. It’s a great style if you work out, are about to deliver a baby, traveling, transitioning to natural, or if you would simply like to try something new. Go for it! 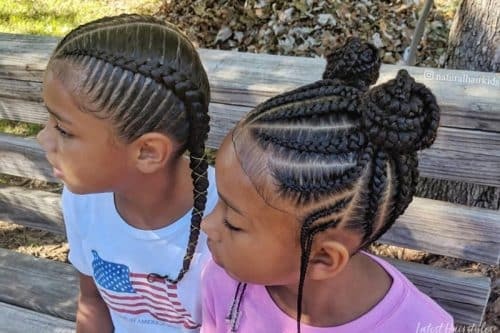 Box braids for kids can be tough if not managed properly. I love this box braids style because it is very versatile. 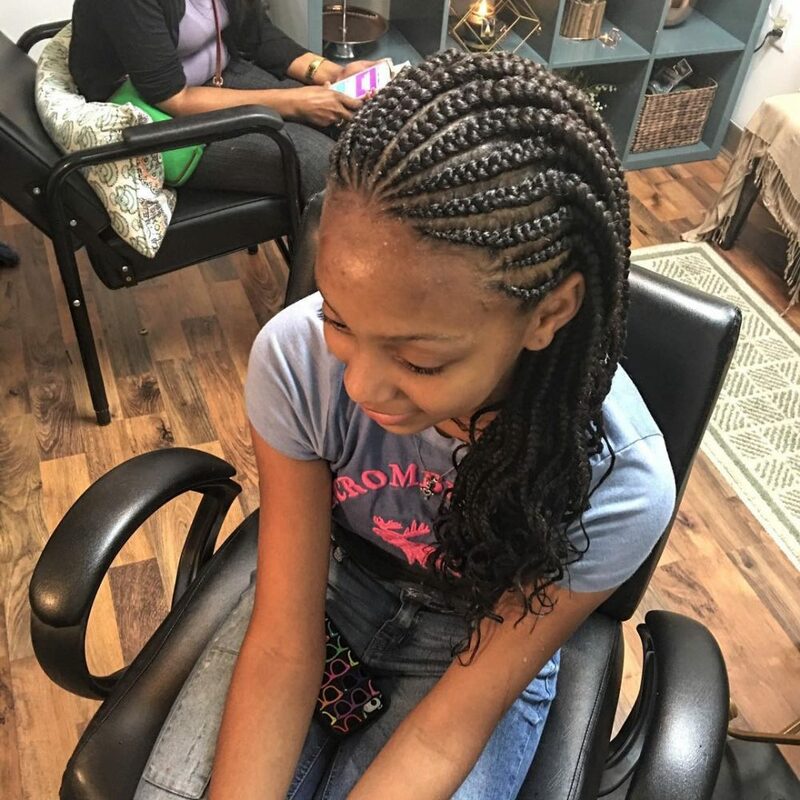 I find that many of my clients love these medium box braids due to it being a low maintenance style which makes it a great option for kids. This box braids style is best when done with synthetic braiding hair. While braiding, it’s good to add a little Jam for a more uniform and clean finish. 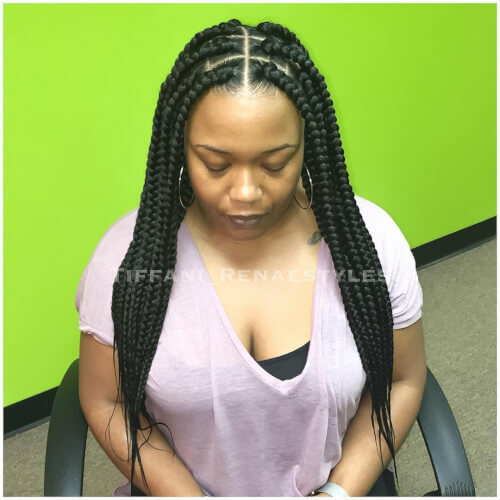 Clients with busy lifestyles love these types of box braids hairstyles. It can be styled beautifully for date night at a restaurant or pulled back for a business meeting, and it’s very popular with those who love to hit the gym! This look is referred to as “Goddess Braids“. 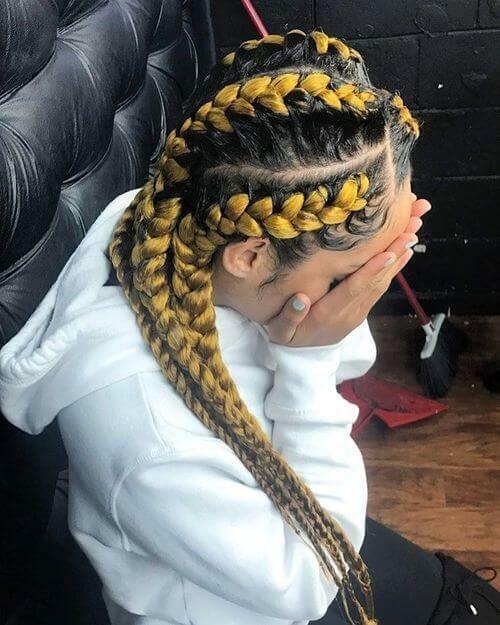 It is unique in its difference from a traditional scalp braid where you braid underhand because you actually braid overhand, causing the hair to bulge out. You can use any holding substance like edge control, gel or jam. I like to use Loc n’ Gel by Cut Creators Salon Suites. Mousse is a great maintaining molder for this style to last a bit longer. I’d recommend these box braids to women of all ages and lifestyles. It looks great for any occasion. The uniqueness of this particular braid makes it suitable for classy and elegant events. 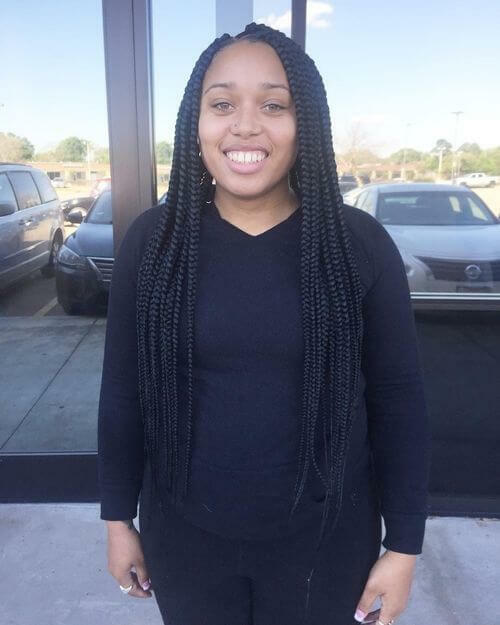 Box braids are larger individual braids with parts that are box shaped. My favorite thing about this ombre box braid is its versatility. It’s able to be worn in many different styles like half up half down, a ponytail, flipped over to one side, and anything else one can think of. To maintain this box braids style you would need to wrap your hair up while sleeping with a scarf. You would also need to put a bonnet on your head with all of the braids inside the bonnet as well. Remember to use some type of oil as needed on the scalp. The braids were also dipped in boiling hot water to give them a more natural appearance and this may need to be done again in about three weeks or so. The products I used to create this look were Rastafri brand braiding hair (Freed’m-Silky-Braid) and Shine N’ Jam which is made by Ampro Pro Style. Anyone who is willing to commit to the proper care and maintenance of these braids. Symmetry. That’s the word that comes to mind when I describe this classically known, single braids style. What makes it so pleasing to the eyes are the all the calculations behind each braid. The three strands need to be weighted evenly, otherwise, you get bumps. The partings must be clean to avoid painful hair tension. And, most importantly, you need to tuck in all of your client’s real hair for frizz camouflage, smoothness and sheen. All of these factors come together to create this perfectly symmetrical gathering of hair and braids. For someone looking to recreate these braids, the first thing I would recommend is to locate me and make an immediate appointment. Otherwise, your local beauty supply store has everything you will need to do it at home. Kanekalon synthetic braiding hair is the type of extension I used. I prefer the brand X-pressions because it has a good density and proper texture to give you sleek braids that don’t feel like cheap plastic. You will also need a good hair oil to properly hydrate your real hair before starting, as well as an edge control conditioning gel for flyaway prevention. With patience and a couple of tutorials, practice makes perfect. 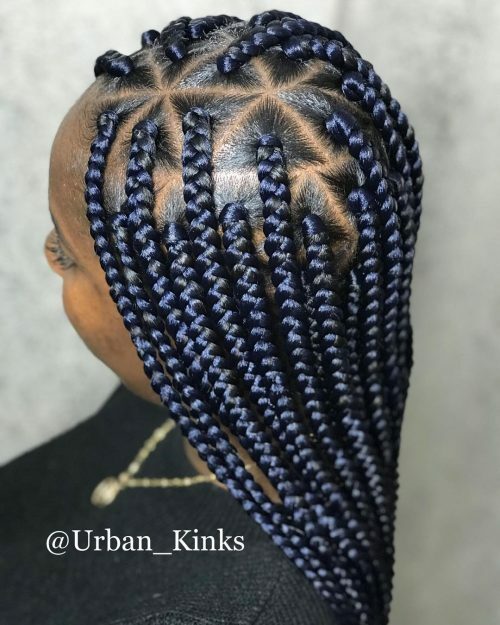 When it comes to making your new box braids style last, this is one of the most low maintenance styles in the braiding world. It only requires that you remember to hydrate your hair at least every other day. I’m a big fan of mixing some water and a hair oil of your choice (such as castor oil) in a spray bottle and spritzing your hair and scalp before walking out the door. I honestly feel that this is a universal braids hairstyle. I have done it on the kinkiest of hair types to the straightest. It can be a great look for children, students, busy moms, or even your lovely grandmother. The key is to find a stylist who knows what they are doing and does not braid too tightly. 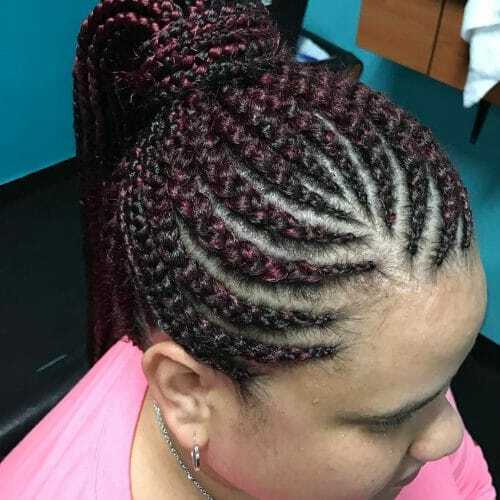 My clients are always surprised at the pain free braiding experience I offer because most don’t know that braids are not supposed to be painful. 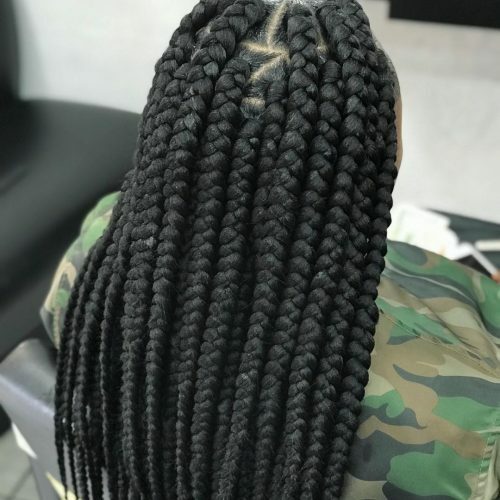 This is a great protective style to help grow your hair by keeping it shielded from too much manipulation for a period of six to eight weeks at most, so it must be done gently. Whether you have a rounder face or finer features, it does not discriminate. Since this box braids style allows for so much versatility, there is a single braid length and width to suit anyone. 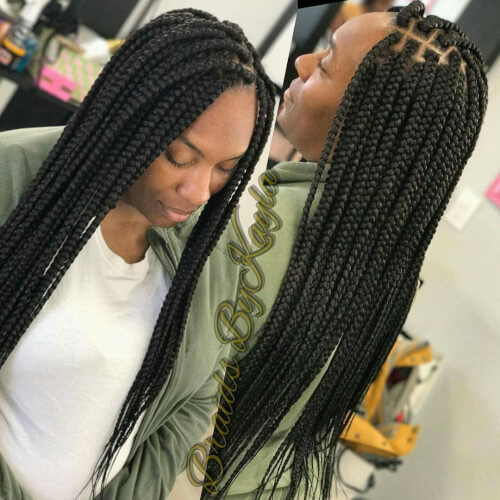 These box braids are trendy, hip and bold. I love how easy it is to maintain. It’s one of those go-to looks when you want to give your hair a break, but also make a statement. Kanekalon braiding hair was used to create this box braids style, along with Edge Control to slick down the roots. I recommend tieing the hair down with a scarf nightly and using Edge Control on your edges when needed to maintain this look. I also recommend oiling your scalp at least every other day to promote growth and to keep up the look of the hair. I think this style works for those who are on the go and have limited time to dedicate to their hair on a daily basis. It can also be good for those who want to give their hair a break from daily manipulation. This style can be rocked by anyone with any hair type, however the longevity of the style will vary depending on your hair texture. Kinkier textures will hold the braids the longest as they are less likely to slip at the roots. This box braids style is old-fashioned, yet still rocks with the latest trends. It’s always popular and in demand. My favorite thing about this style is that it is a “get up and go” style. It’s a protective style and you can style it multiple ways so it never gets boring. The products I recommend to maintain this look are a hairspray and mousse. You don’t want to mousse it all the time, but when you do, definitely spray some hairspray to get the shine back. Most importantly, wrap this style up before going to sleep every night. This will keep it from fraying too soon. The products I recommend to recreate this box braids style are Jam, a comb, and hot water. These braids can be for anyone! All hair types, all face shapes and all lifestyles can wear this. I would not recommend getting this style if you are suffering from any type of hair loss disease and have really thin hair as this hair varies on weight depending on size and length. This is an attractive hairstyle that is great for giving your hair a break from everyday styling. My favorite thing about the hairstyle is that it can be styled up or down to suit any occasion, and that it lasts for one to two months. This box braids style is relatively low maintenance. It only requires washing deep conditioning and moisturizing every seven to ten days. The products I recommend are: Head and Shoulders Soothing Scalp Care shampoo, Head and Shoulders Soothing Scalp Care conditioner, Head and Shoulders Instant Relief spray, and Sulfur 8 braid spray. To recreate the look, it is important to prep the hair with a shampoo, deep conditioner and blow dry. To create the style, you will need a comb, synthetic hair fiber, hair cutting scissors, hair moisturizer and gel. 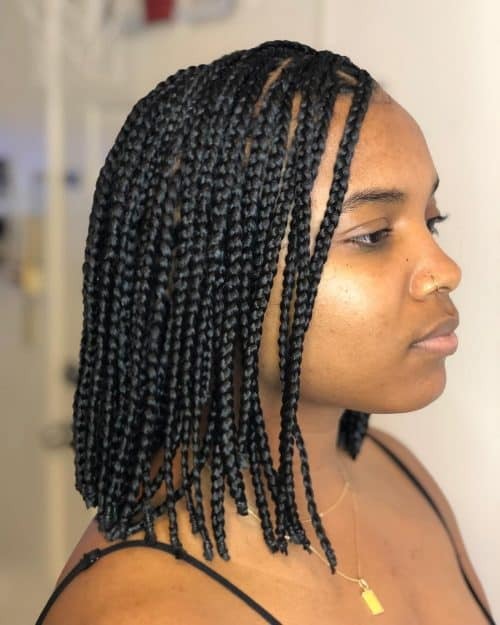 This box braids style was done over short locks, so box braids are a great way of adding length for someone still growing their locks. This look can be styled in many ways to make it suitable for all face shapes. 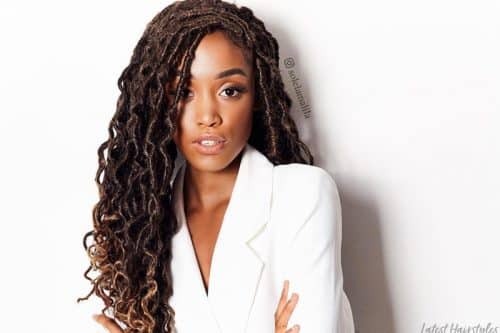 This box braids style is a versatile and easy style that can be pinned up for an elegant updo, or you can let it all hang down for a sassy, carefree look. My favorite style is to bun the top and let the back hang down for a combination of both looks, but the styles are endless for box braids. My favorite thing about it is that it’s a great protective style for natural hair. It is long-lasting (can be worn up to 3 months) and again, super versatile. The healthiest way to install and maintain this protective style is to start with thoroughly cleansed, conditioned and moisturized hair. I like a variety of brands that are all natural and free from parabens and sulfates. Thoroughly detangle hair with a good leave-in conditioner or moisturizing cream. I like Shea Moisture’s Curl Enhancing Smoothie and Hair Milk, Taliah Waajid Easy Herbal Comb Out, and Ouidad Moisture Lock Leave-In. 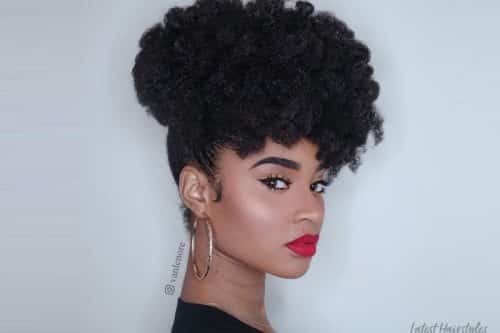 Maintain this style with a good moisturizing spray that you can purchase or make yourself by adding water and your favorite oil (essential oils and/or conditioner) in a cheap spray bottle. Ideas for cocktail recipes are endless, and I recommend spraying the scalp and hair daily for maximum benefits. This is one of many go-to protective styles that can be worn by anyone. Any face shape, hair type or lifestyle can pull off this look. I do recommend that the box braids be between jumbo to medium-sized as small and micro-sizes can contribute to breakage, especially for fine textures of hair. It is also important to use an equal ratio of hair extensions to natural hair to minimize breakage. No one wants heavy braids! 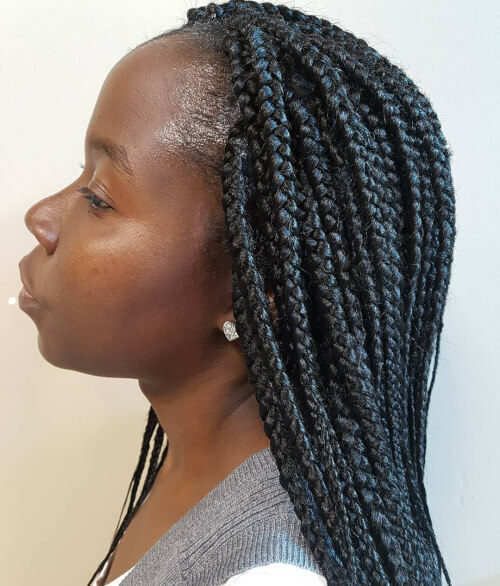 This protective style is great for the natural who is seeking a protective style to aid in length retention and for those seeking a low maintenance, long-lasting style. It is also a simple style for a vacation getaway. Feel free to get them wet in the pool! This look is a cornrow ponytail. My favorite thing about it is the feed-in technique to make the braid look more natural. All you need is some Kenekalon braiding hair and your favorite hair products for moisture. This hairstyle is great for all face shapes. Is a great style if you like to get up and go. It’s great for traveling, vacationing, or if you just want a fun style. Jumbos are a simple, yet very cute and quick hairstyle. Jumbo box braids could give a girly, sporty or sophisticated look, all depending on how you dress them up or style them. For example, jumbos braid in a bun would be a suitable style for a woman going into an interview or a meeting. If she was just going on a casual outing, a half up half down style would be perfect. 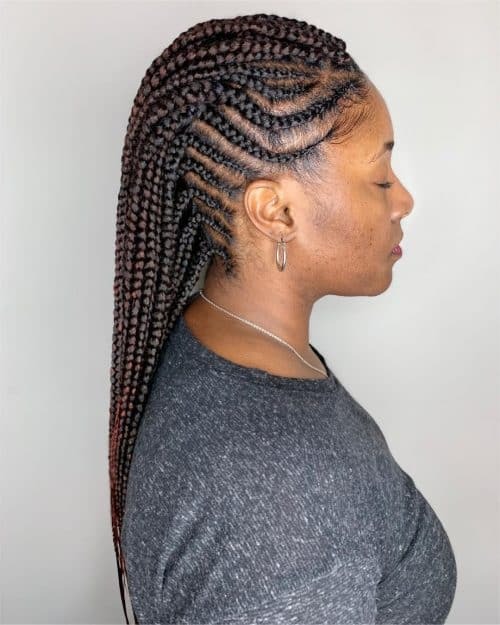 You will definitely need a rat tail comb, jam, and your favorite edge control to recreate this box braids style to ensure that you get the same clean. neat look. You can also add accessories which are simple things you’d use in arts and crafts and can find at Michael’s. I recommend these box braids for any clients. It the perfect style for those going on vacation or women just simply wanting a break from their hair. However, when choosing this style and stylist, be cautious of the amount of hair being used in your braids. You want this to fit your head and hair texture. If done incorrectly, they can weigh the natural hair down and/or cause damage. This is a twist on the a-line bob. My favorite thing about it is how well it frames the client’s face. This client desired short box braids to keep her hair off her neck and have an easy low maintenance look. Her hair was longer than the look desired. 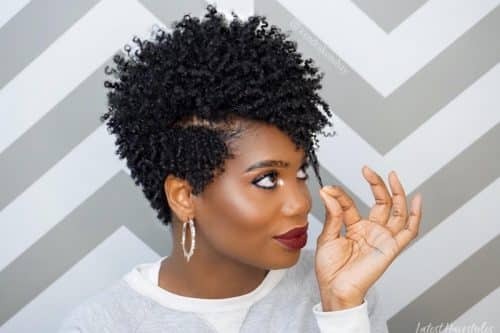 My tip is to use crochet braids in the back to allow for the desired short length while still protecting the health of the client’s natural hair. This box braids style is great for clients with coarse, curly hair and busy lifestyles that are looking to take a break from daily styling. The a-line bob is great for oval and round face shapes looking to create balance. Color can also be added to this look for someone wanting to try something new, but not yet ready to commit to a drastic change.